For three hundred years the Book of Hours was the bestseller of the late Middle Ages and the Renaissance. From the mid-thirteenth to the mid-sixteenth century, more Books of Hours were commissioned and produced, bought and sold, bequeathed and inherited, printed and reprinted than any other text, including the Bible. They exist in vast quantities. In the United States, great collections of Books of Hours are owned by The Morgan Library & Museum in New York and the Walters Art Museum in Baltimore. The collections of the British Library in London, the Bibliothèque nationale de France in Paris, and the Biblioteca Apostolica Vaticana in Rome are even richer in this genre. And this is not to mention the large number of Books of Hours to be found in the major university libraries here and abroad. To this day, the Book of Hours is the most frequent type of book to appear in antiquarian booksellers' catalogues and at the auction houses. The many single leaves circulating in private collections are, more often than not, from Books of Hours. One of the reasons for this popularity lies in the book's contents. The Book of Hours is a prayer book that contains, at its heart, the Little Office of the Blessed Virgin Mary, that is, the Hours of the Virgin. For this reason the Latin term for the book is Horae (Hours). The Hours of the Virgin are a sequence of prayers to the Mother of God that, ideally, were recited throughout the course of the entire day, sanctifying it through her to God, Hour by Hour. Other prayers usually found in Horae helped round out the spiritual needs of late medieval and Renaissance men and women. The Penitential Psalms, for example, were recited to help one resist temptation to commit any of the Seven Deadly Sins (which could land one in hell). The Office of the Dead was prayed to reduce the time spent by one's friends and relatives in the fires of purgatory. The Book of Hours played a key role in the late medieval and Renaissance cult of the Virgin. Marian devotion placed the Mother of God in the pivotal role as intercessor between man and God. As our spiritual mother, Mary would hear our petitions, take mercy on our plight. She would plead our case to her Son who, surely, could not deny his own mother anything for which she asked. 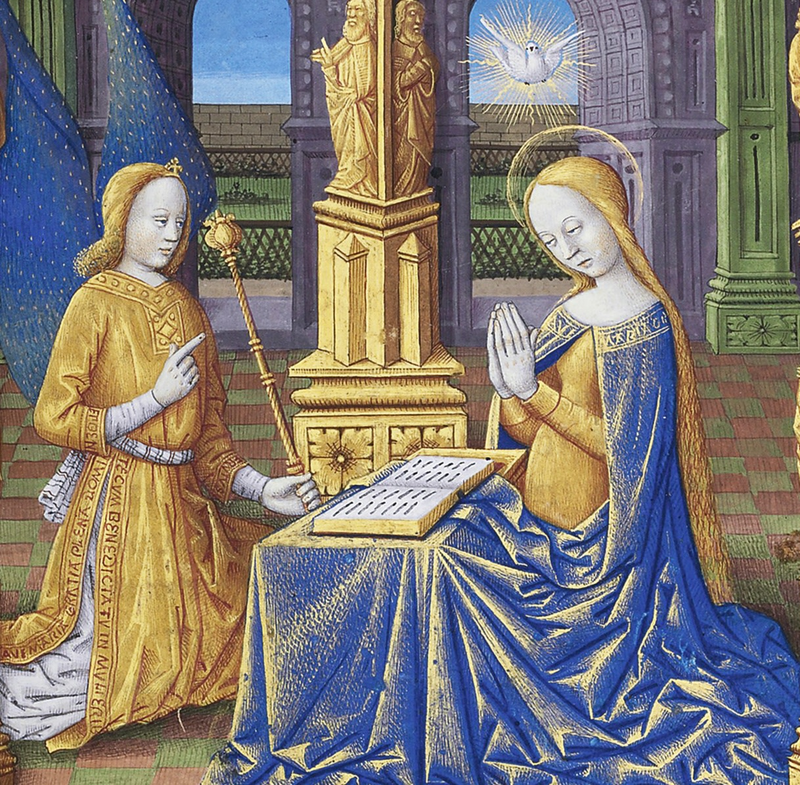 In a Europe dominated by cathedrals dedicated to Notre Dame, the Hours of the Virgin were deemed Our Lady's favorite prayers, the quickest way to her heart. The Hours of the Virgin are at least as old as the ninth century; it is thought that they were developed by Benedict of Aniane (c. 750-821) as part of a monastic movement that could not pray often enough. To the Divine Office, the daily (including nightly) round of prayers the medieval Church required of her ordained (priests, monks, and nuns), were added the Hours of the Virgin. By the mid-eleventh century, they were an established practice; the Hours would be chanted in church from large choir books called Antiphonaries. By the late twelfth century, the Hours were also found in Psalters, the prayer books containing all 150 Psalms, a Calendar, and among other prayers, usually the Litany and the Office of the Dead. By the early thirteenth century, an era of increased literacy, Psalters and combined Psalter-Hours were used by the laity as well as by the ordained. By the mid-thirteenth century, however, it became common for laypeople to ask for prayer books not containing the cumbersome Psalter section but with the other parts, such as the Calendar, the Litany, and the Office of the Dead, intact. Thus, the Book of Hours as we know it was born. By the late fourteenth century, the typical Book of Hours consisted of a Calendar, Gospel Lessons, Hours of the Virgin, Hours of the Cross, Hours of the Holy Spirit, the two prayers to the Virgin called the “Obsecro te” and the “O intemerata,” the Penitential Psalms and Litany, the Office of the Dead, and a group of about a dozen Suffrages; any number of accessory prayers complemented these essential texts (See the Tutorial). Books of Hours were easy, even enjoyable, to use. The core text, the Hours of the Virgin, remained basically the same every day. The only variable was the three Psalms that constitute the nocturn of the first Hour, Matins (these Psalms changed depending on the day of the week). The contents of the remaining Hours, Lauds through Compline, did not change (some Horae, but by no means all, contained a few textual variations for the Advent and Christmas seasons, but these were minor). The other parts of the typical Book of Hours were completely unchanging: the Gospel Lessons, the Hours of the Cross and of the Holy Spirit, the Penitential Psalms, the “Obsecro te” and “O intemerata,” and the Office of the Dead. One was certainly encouraged to pray the Hours of the Virgin (and, time permitting, the Hours of the Cross and of the Holy Spirit) and the Office of the Dead on a daily basis. The other common texts offered plenty of variation, as did the numerous accessory prayers that owners freely included in their Horae. Until around 1400, Books of Hours were entirely in Latin. Around this time, some French appeared in Horae made in France, but it was not a significant amount (Calendars, some rubrics, and a few accessory prayers might be in the vernacular). The same can be said about the extent of English in Books of Hours made in England or made for use there. The only major role played by a vernacular language in the history of Books of Hours is found in Dutch Horae. Geert Grote (d. 1384) translated the standard texts of the Book of Hours into Dutch as part of the Devotio moderna, the late medieval reforming movement that encouraged pious reading in the vernacular. This translation achieved great success, and throughout the course of the fifteenth and sixteenth centuries, Books of Hours produced in the northern Netherlands were almost always in Dutch. Disregarding this latter phenomenon, however, Books of Hours are books of Latin. How much did the lay reader understand? Probably more than we might initially think. Speakers of French and Italian, of course, had an easy ear for the language. Furthermore, the great armature for most prayers in the Book of Hours is Psalms. A total of thirty-seven Psalms form the Hours of the Virgin; these did not change. Nor did the seven of the Penitential Psalms or the twenty-two in the Office of the Dead. Other biblical excerpts--the four Gospel Lessons, the Passion according to John, and the readings from the Book of Job (in the Office of the Dead)--would become equally familiar over time. Much of the remaining Latin is in rhymed verse, such as the “Stabat Mater” and the “Salve sancta facies,” or as with the Suffrages, it is rather simple “Church” Latin. Most literate people had some working knowledge of Latin, and they knew certain basic prayers--“Ave Maria” (Hail Mary), “Pater noster” (Our Father), “Credo” (Apostles' Creed), and “Confiteor” (the prayer beginning, “I confess to Almighty God”)--by heart. As children they learned to read from Books of Hours. In England, Books of Hours were called primers, a word that eventually came to mean the book from which a child first learned to read and pray. The term derives from the Hour of Prime (recited early in the morning), the first of what are called the “little” Hours of the Hours of the Virgin (that is, Prime through None). Books of Hours made for young eyes were usually written in big letters or printed in large type; they also contain things like an ABC, Our Father, Hail Mary, Apostles' Creed, and the “Confiteor” on their first folios. Long ago memorized by every adult, these items, of course, are not found in a grown-up's Book of Hours. Another reason Books of Hours were so popular was because of the people who used them. Although the Church's ordained (priests, monks, and nuns) occasionally owned them, it was the laity who formed the real audience for Books of Hours. In a kind of bibliophilic jealousy, laypeople during this period sought for themselves a book that paralleled the use and function of the Breviary, the book containing the Divine Office that the clergy prayed from daily. In an age when rood screens blocked all but the most fleeting views of the Mass, when squints were pierced into walls in an effort to offer some glimpse of the Elevation of the Eucharist, when, in other words, the laity's access to God was very much controlled and limited by others than themselves, Books of Hours bestowed direct, democratic, and potentially uninterrupted access to God, the Virgin Mary, and the saints. Marks of ownership in Books of Hours, however, are not restricted to portraits. Their range includes coats of arms, initials, monograms, mottoes, and personal emblems, which are used singly or in all combinations possible. In the course of their three-hundred-year history, Books of Hours offer case studies that cover all the possibilities of how men and women of the late Middle Ages and Renaissance acquired their books. People commissioned them, received them as gifts (brides especially), inherited them, bought them new or secondhand from bookseller's stock, borrowed them, sometimes made them themselves, and indeed even stole them. The range in their quality--from a specially illuminated manuscript with hundreds of pictures to a poor man's unillustrated Horae printed on paper--speaks not only of deep or shallow pockets but also of a vast audience with a shared mind-set. By the late fifteenth century, when printing made the Book of Hours available to a whole new category of customers, any literate soul, even on the slimmest income, could buy one. A great part--really the greater part--of this lay audience was female, and women played a key role in the patronage of Books of Hours throughout their entire three-hundred-year history. In the first hundred and fifty years, this patronage was essential, and it was due to women that the genre took off. Women, it was thought by their male clerical advisers, needed the pictures to help them in their piety. The images were, literally, visual aids. This, finally, leads one to consider the pictures, for therein, too, lies much significance for the continual popularity and success of Books of Hours. As well liked now via Christmas cards as they were then, the pictures in any Book of Hours were often the only form of art owned by the middle class. Even to the wealthy, who could commission paintings and tapestries for their castle or chapel walls, miniatures in Books of Hours were a continuous source of aesthetic pleasure. One did not need more than one Book of Hours, but those who could afford to sometimes owned several; Jean, duc de Berry, owned about fifteen. The pictures in Books of Hours, whether manuscript or printed, were, of course, versions of the subjects people saw at church. The main text, the Hours of the Virgin, was marked by a series of pictures illustrating either Christ's Infancy or his Passion. The events relating Christ's birth or his death were the same to be seen depicted in the multiple panels of a medieval or Renaissance altarpiece. The Nativity of Christ was the central event in the Christmas season, which started with the First Sunday in Advent (in late November) and ended with the Feast of the Purification of the Virgin (February 2). Christ's death and Resurrection were the key events in the next season, which began on Ash Wednesday, the first day of Lent, and concluded with Christ's Ascension and the Feast of Pentecost, the descent of the Holy Spirit. (Sundays after Pentecost fill out the rest of the year until one again returns to Advent.) Thus, in one's Book of Hours one had a mirror of the Church's entire liturgical year in pictorial form. Suffrages were illustrated by images of the saints who were the object of the petitions. These, of course, were the same saints who were also seen at church, at side altars or in stained glass. These pictures had two main functions. On a practical level, they indicated where the major texts began; they were bookmarks (Books of Hours, manuscript or printed, were originally neither foliated nor paginated). Second, as they marked certain texts, they also embodied them. They provided the themes upon which to meditate; they were “painted prayers.” The miniatures or prints depicting in one's book the mysteries of the Incarnation, the sorrows of the Passion, or the chill of death could stir the same emotions as the images one saw at church. Books of Hours linked church and home. The entire celestial court, God and his cosmos, could be held within the palms of one's hands and taken home. The Virgin, in the two popular prayers called the “Obsecro te” and “O intemerata,” is addressed in the first person singular; one could insert one's name in the prayer. Used at home, the Book of Hours transformed one's chamber into a chapel. A Book of Hours printed in 1538 in Rouen for English export (use of Sarum) by Nicholas le Roux for François Regnault contains an introductory section called “The Preface and the Manner to Live Well” (spelling modernized). Its instructions reveal how a Book of Hours was actually used: “First rise up at six of the clock in the morning in all seasons and in your rising do as follows. Thank Our Lord of rest that he gave you that night, commend you to God, Blessed Lady Saint Mary, and to that saint which is feasted that day.... When you have arrayed yourself in your chamber or lodging, [say] Matins, Prime, and Hours if you may. Then go to the church..., and abide in the church the space of a low mass, while there you shall think and thank God for his benefits.... When you are come from the church, take heed to your household or occupation till dinner time.... Then take your refection or meal reasonably, without excess or over much.... Rest you after dinner an hour or half an hour as you think best.... As touching your service, say unto Terce before dinner, and make an end of all before supper. And when you may, say Dirige [Office of the Dead] and Commendations for all Christian souls, at the least way on the Holy Days and, if you have leisure, say them on other days, at the least with three lessons.... “(Pierpont Morgan Library 19585, ff. C6r-C8r). When Books of Hours came to be printed, in the late fifteenth and the sixteenth centuries, their pictures, made accessible to an even wider market, insured their meteoric success. (Between 1480 and 1600 there were some 1,775 different Horae editions printed.) This success was initially due in part to the cycles of small border vignettes with which the printers of Books of Hours were able to embellish their products. This was a selling point, and they knew it; printers often boasted about their pictures on their title pages. As the following selective list indicates, the cycles' range of subjects is quite extraordinary: lives of Christ and the Virgin, saints and evangelists, the Dance of Death, the trials of Job, children's games, heroines, sibyls, the Fifteen Signs of the Second Coming, the story of Joseph, the Seven Sacraments, the Seven Virtues, the Seven Vices, the Triumphs of Caesar, the story of Tobias, the Miracles of Our Lady, the story of Judith, the Destruction of Jerusalem, and, finally, the Apocalypse. In the middle of the sixteenth century the Catholic Church made two decisions, in the context of reforms following the Council of Trent, which caused the immediate decline of the Book of Hours. In 1568 Pope Pius V removed the obligation on the part of the clergy to pray the Office of the Blessed Virgin Mary, and in 1571, with a desire to standardize the Church’s liturgy, he prohibited the use of existing copies of the Office, requiring those who wished to pray it to acquire newly approved editions. Books of Hours constitute one of the most significant groups of cultural artifacts from the late Middle Ages and Renaissance. Indeed, from the mid-thirteenth to the mid-sixteenth century, more Books of Hours were produced, both by hand and by press, than any other type of book. They were the bestsellers of an era that lasted 300 years. In an era when some of the most important painting was in books, the illuminated miniatures in manuscript Books of Hours are the picture galleries of the Middle Ages. And straddling the revolution of manuscript to print, Books of Hours are the great constant in a sea of changing readership and competing markets. We gratefully acknowledge permission from The Morgan Library & Museum to quote here from the Introduction to Roger S. Wieck, Painted Prayers, The Book of Hours in Medieval and Renaissance Art, New York, George Braziller, Inc. in association with The Pierpont Morgan Library, © 1997 by The Pierpont Morgan Library.